The best table saws for woodworking and carpentry come in compact sizes but are extremely powerful, capable of ripping, beveling, crosscutting and mitering almost any material with great accuracy and precision. Due to their size, they offer great storage benefits and are also quite low maintenance. Since this is a bench-top machine, it is possible for you to get a good look at what exactly it is that you are doing as the best table saw tends to sit still while the wood is being fed to it. A table saw is not infallible and it does have its share of drawbacks – it lacks the scope and focus of bigger and costlier tools like a stationary shop saw or a contractor’s saw, and you find it hard to use it against thick lumber pieces. However, on the bright side, the majority of table saw models available in the market are accurate and tough enough to deal with regular renovation and repair work around the home environment. There are many different types of table saws available in the market and you need to carefully understand your own requirements in order to find the perfect tool for the job. Top rated table saws are easily available in most hardware stores but you should look around in order to find better deals. 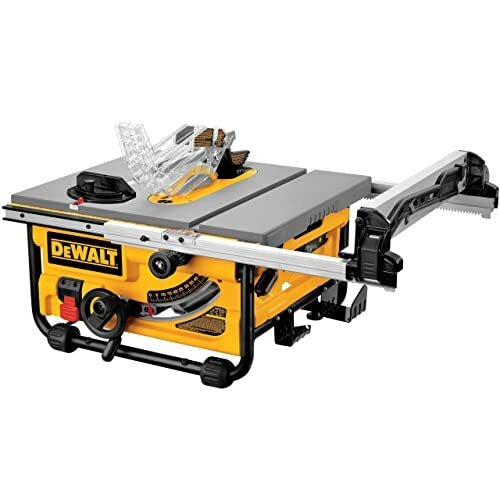 A lot of online e-commerce websites also have a good collection of table saws available and it is necessary to compare the price in order to find the best table saw deal. ​In this article, we are going to engage in a comparison regarding in the 5 best table saws that are available in the market at this time and once you have perused the content, you will not only increase your knowledge regarding the subject but will also get a good idea about their benefits and their drawbacks, allowing you to make an informed decision when purchasing the same. 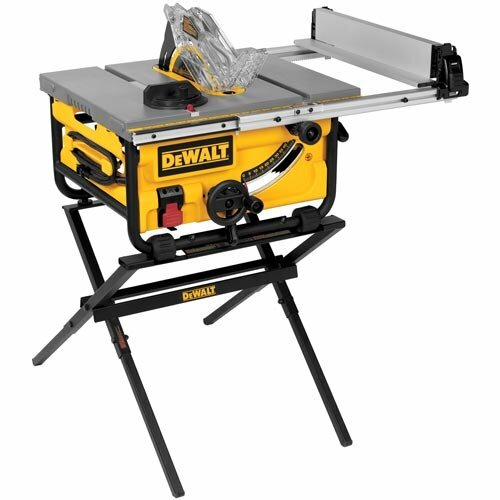 DEWALT is a trusted brand and this new 10-inch table saw model is extremely versatile, boasting of the Site-Pro Modular Guarding System to deal with application-focused setups that produce precise and fast cuts. The device combines a portable and compact design with a powerful motor of 15 amps as well as a big 20-inch rip capacity. Blade guards are included with this table saw along with a push stick, a miter gauge and a handy and stable 24 tooth carbide blade that is 10 inches in length so that you are able to start your project immediately. This table saw from DEWALT is capable of delivering incredible power thanks to the inclusion of a high torque motor with 15 amps output that can handle difficult tasks such as cutting pressure-treated lumber and hardwood. The 10-inch blade of the saw tends to spin at3850 rpm speed to produce clean cuts in less time. This tool can be used for different applications all thanks to the handy Site-Pro Modular Guarding System that is not just easy to set up but gives you the opportunity to make tool free adjustments to application-focused guarding parts. The unique fence configuration of this table saw allows for a large rip capacity of 20 inches. The inclusion of pinion and rack fence rails allow you to get fence adjustments done in a smooth, quick and accurate manner. The telescoping design of the fence permits the rails to increase to a length of 20 inches to tear through full sheets of materials. You may even retract the fence to gain a more compact design that is simpler to transport. The surface of the table remains coated for lowering friction to improve the cut quality throughout the board while the inclusion of a metal roll cage base offers a strong setup along with enhanced durability in comparison to plastic bases. Weighing just 45 pounds, you can move this product from the workshop to the worksite without any sort of difficulty. The product comes with a limited warranty of three years. This model of table saw from DEWALT comes with pinion and rack telescoping fence rails that allows the users to make adjustments to the fence in a quick and precise manner. The tool boasts of a rip of 24-1/2 inches that cuts various big shelving as well as trim materials without any hassle. Adjustments can be made based upon the application without tools thanks to the Site-Pro Modular Guarding System. This table saw is powerful enough to rip easily through hardwoods owing to the 4800 rpm motor of 15 amps. The device comes with a 24 tooth carbide blade that not only extends blade life but also improves cut quality. In case, you wish to use the device for beveling, all you need to do is adjust the blade between 0 and 45 degrees. 10” blades are used by this system with an arbor size of 5/8”. The rear feet of this table saw are fully adjustable and have been designed in such a way that they level this compact table saw on table coating and work surfaces that are uneven and limits the amount of friction generated to facilitate smoother cutting. A dust port permits 2-1/2 inch of vacuum hook up and lowers the amount of cleanup required. On-board storage is present and an exclusive stand comes with a heavy-duty tube steel build for maximizing durability. The saw can be secured to the stand via handy support bar hardware holes. Capable of folding flat, this stand allows for easy transport and storage. This table saw model from Bosch boasts of some amazing new improvements and features that results in durability, accuracy and high performance. This table saw features the first modular smart guard setup in the industry. Moreover, it boasts of an innovative and extremely tough sub-base that comes equipped with carry handles, a t-slot miter gauge as well as a SquareLock Rip Fence featuring auxiliary fence slots. All of these features have made Bosch one of the most beloved brands in the industry and this model takes the top spot in the table saw category. 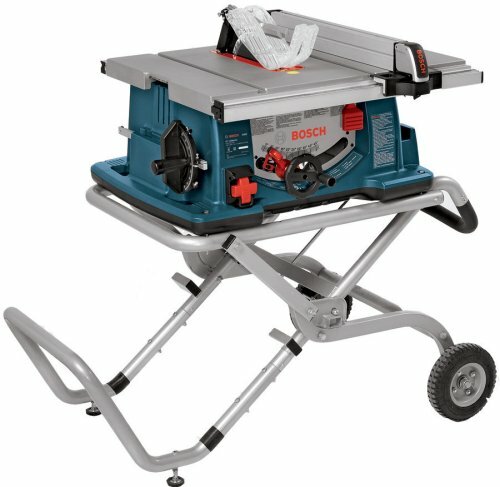 The modular smart guard mechanism from Bosch has an innovative new design meant for the best portable table saws that features a riving knife, a blade guard, and anti-kickback pawls. These elements are all tool free and modular, so it is possible for users to easily and quickly add or remove every component separately depending upon the task at hand. If you wish to experience maximum protection along with perfect line of sight, then you should check out the blade guard that comes with a new split-guarding mechanism. You no longer need to worry about material pinching the blade thanks to the riving knife. Durability is always a necessity for professional gadgets and you get that in this model, thanks to the hardy sub-base that also features integrated carrying handles for simple and fast transport. This table saw offers users the maximum usable tabletop space in the industry at 29 x 21-1/2 inches square and it also boasts of a rip capacity of 25 inches that is capable of handling larger stock and sheet goods easily. Changing blades is no longer a hassle thanks to the arbor lock system. 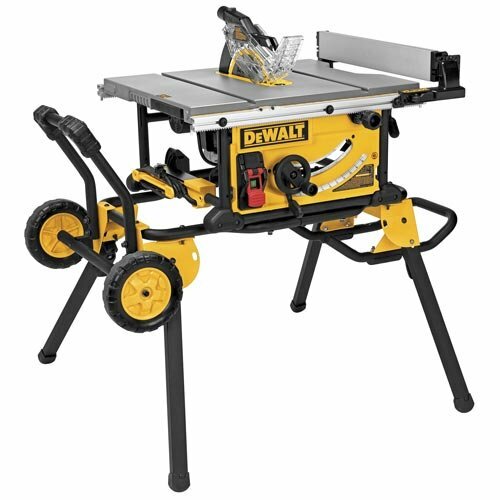 This model of table saw from DEWALT is one of the best in its class boasting of a rip capacity of 32-1/2 inches along with a pinion and rack fence system equipped rolling stand that makes the adjustments of fences rather smooth, accurate and quick. You are able to use this product to cut a large range of trim materials as well as shelving. Due to the patented material support, this tool can be used to produce narrow rip cuts and there is also a 15 amp motor capable of ripping quickly through hardwoods without difficulty. The fence rails with telescoping properties are capable of extending easily and retracting for the purpose of forming a tiny best portable table saw package. Moreover, the flip over ripping fence permits you to achieve narrow rip cuts. This table saw from DEWALT provides you with an astounding depth of cut up to 3-1/8 inches at 90 degrees along with 2-1/4 inches at 45 degrees. You no longer need to be concerned with cleaning up and dust extraction since the dust collection port of 2 inches gets easily attached to a vacuum. This device comes with a rolling stand that is not only easy to set up but it promises amazing stability and includes heavy duty, large wheels that are capable of rolling easily over steps, jobsite debris and curbs. You get amazing material support thanks to the table measuring 26-1/4 x 22 inches. This particular unit comes with an on-board storage mechanism that not only offers uninterrupted access to the Site-Pro Guard parts but also the push stick while the device is not in use. 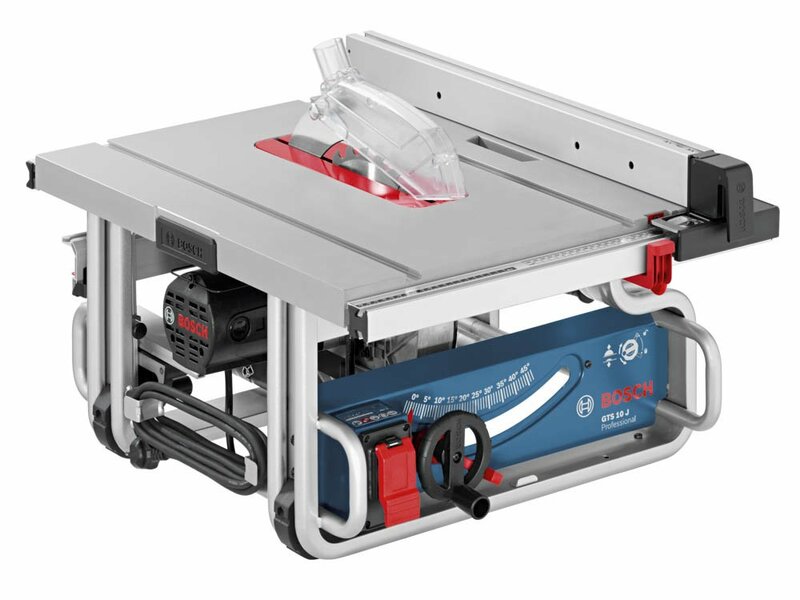 If you are looking for the best portable table saw that will allow you to make long rip cuts in wood, then you should definitely check this product from Bosch that offers superior durability and portability in a single package. You can deliver your cuts quicker with this table saw. This product is capable of delivering an amazing 5,000 RPM cutting speed to complete the task quickly and efficiently. You always get consistent and accurate results with this product as its SquareLock fence remains straight. Moreover, it comes with a Smart Guard mechanism that provides you with enhanced control during cutting. The table saw boasts of a compact and efficient design and it also comes with a carry handle so that you can easily carry it with one hand to take to different jobsites. The tool has an all-steel base which is high durable and allows the saw to bear the brunt of impacts as well as other on-the-job conditions. There is sufficient storage present underneath to hold all your accessories. Measuring 10 inches, this compact table saw is capable of beveling a range between -2 and 47 degrees and is one of the best table saws under 500 currently available in the market. How should you research table saws before buying? If you are thinking about buying a table saw but don’t know how to proceed, then resort to the Internet. You will not only learn loads but become aware of the different and what are the special features they have on offer. You could also consult an expert at your local hardware who handles these tools firsthand and can get an idea about what sort of tool you wish to buy. What are the types of table saws you can buy based on usage? It is always best to buy a table top saw that comes with a heavy duty fence and locks down square to the blade. Should you pick a contractor saw with advanced features? Various brands are present in the industry that are capable of manufacturing highly powerful and compact table saws but you need to understand your requirements before you decide to invest in the product. If you want a professional table saw that is extremely powerful, then you should pick product 3. If you want the best table saws for home use, then numbers 4 and 5 should be your pick. Users who want versatile blade saws, should pick number 1 and 2.